Indianapolis – The National Collegiate Athletic Association announced its 2013 winter sports postgraduate scholarship winners earlier this week. Among the list of 29 male and 29 female winter sports student-athletes was Gustavus senior track and field competitor Allyson Voss (Wausau, Wis.). “It was such an honor for me to receive a nomination from Gustavus for this award, and I feel very fortunate to have received the scholarship,” said Voss. 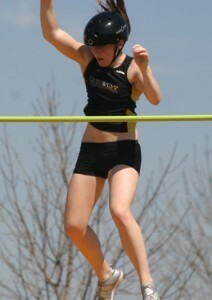 Ally Voss clears the bar at the MIAC Championships last spring. To qualify, student-athletes must excel academically and athletically, be in their final year of eligibility and plan to pursue graduate study. Student-athletes must also maintain at least a 3.2 grade-point average and be nominated by their institution’s faculty athletics representative. Created in 1964, NCAA postgraduate scholarships promote and encourage education by rewarding the Association’s most accomplished student-athletes. Voss is the 34th Gustavus student-athlete to receive an NCAA postgraduate scholarship since football player James Goodwin became the first in 1974. She is also the second postgraduate scholarship winner from Gustavus this school year, as cross country runner Beth Hauer took home the award following her season in the fall. Because Ally was nominated as a winter sports athlete, her indoor track and field accolades were taken into consideration. Over her four-year collegiate career, Voss participated in the pole vault at 21 indoor track and field competitions. She recorded 16 finishes inside the top three and has collected nine first place finishes. During her senior season alone, Voss did not finish outside the top two, earning four gold medals out of the six meets she took part in. With a first place performance at the 2013 MIAC Championships, Voss became the first Gustavus track and field athlete to win two MIAC indoor pole vault titles. A three-time All-Conference performer, she placed third (10’ 11.75”) in 2010, and claimed the top spot on the podium in 2012 (11’ 0.75”) and 2013 (12’ 4.5”). Her 12-foot 4.5-inch performance at this year’s indoor MIAC meet broke the meet and school records. Both marks were held by Gustie Janna Castellano and were set in 2007. Castellano’s meet record was 12-feet 2-inches while her school record stood at 12-feet 3.5-inches. At the 2013 NCAA Indoor Track and Field Championships, Voss narrowly missed All-America status with a ninth place finish after clearing a height of 12-feet 3.5-inches. Although her accolades on the track are impressive, so are her accomplishments off the track. In the spring of 2012, Voss received a Critical Language Scholarship to study the language of Urdu in India during the summer of 2012. In late April of her senior year, she was awarded a Fulbright English Teaching Assistantship Grant to Spain for 2013. After graduation she will head to Spain for nine and a half months to serve as an English Teaching Assistant within a Spanish school. Voss is the 34th Gustavus student-athlete to receive an NCAA Postgraduate Scholarship. A double major who will graduate in June with degrees in Spanish and sociology and anthropology, Voss carries an impressive cumulative grade point average of 3.94. If her commitment to her studies and being one of the top NCAA Division III pole vaulters wasn’t enough, the Wausau, Wis., product is also a member of the Sigma Sigma Sigma sorority, and is a volunteer through the Big Partner Little Partner program. 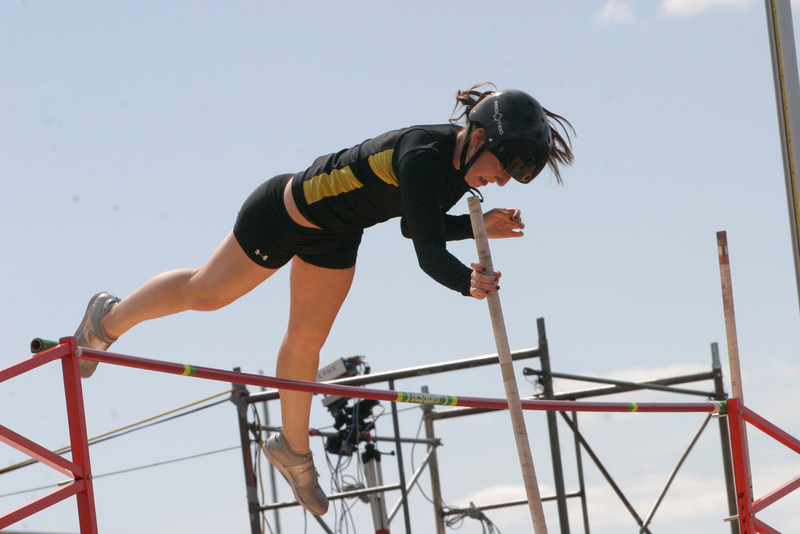 Ally Voss’s collegiate athletic career is not done yet, as the Black and Gold’s most decorated pole vaulter will look to cap her four-year tenure on a high note in her native Wisconsin on Thursday. Voss, who is the only Gustavus All-American in the outdoor pole vault, looks to earn All-America status once again the NCAA Outdoor Track and Field Championships being held his weekend at Roger Harring Stadium at Veterans Memorial Field Sports Complex in La Crosse, Wis.
Voss enters the competition ranked eighth in the country with a qualifying height of 12-feet 5.5-inches. She took gold at the MIAC Championships for the second straight year, becoming Gustavus’s first four-time All-Conference performer in the outdoor pole vault. Her performance at the MIAC meet on May 11th bested St. Thomas’s Karoline Bastiaens’s 2003 MIAC meet record of 12-feet 5.25-inches. The NCAA awards up to 174 postgraduate scholarships annually, 87 for men and 87 for women. The scholarships are awarded to student-athletes in their final year or intercollegiate athletics competition that excels academically and athletically. The scholarships are one-time, non-renewable grants of $7,500 that can be used for research, books, tuition and other educational expenses at any graduate school.